In baseball, disconcertion of the batter occurs when a fielder distracts the batter during a pitch delivery in contravention of baseball rules pertaining to unsportsmanlike conduct. Although rare, the most common form of disconcertion is movement intended to disrupt the batter's concentration while the distracter's teammate—the pitcher—is in the middle of his delivery. Barrett identifies Villar's disruptive behavior. Baseball's rules book prescribes a precise penalty for unsportsmanlike disconcertion: the offender is to be removed from the game and must leave the playing field. In other words, the penalty for unsporting disconcertion is ejection from the game. The following play concerns a fielder who distracts the batter, but is he guilty of unsportsmanlike conduct? The Play: With two out and one on (R3), Cardinals batter Stephen Piscotty prepares to receive a 2-0 pitch from Brewers pitcher Zach Davies. During Davies' delivery, however, Piscotty observes something in his line of sight, and seemingly gives up on the pitch. After ruling the pitched ball a strike, HP Umpire and Crew Chief Ted Barrett motions to 2B Umpire Lance Barksdale to address a Milwaukee fielder before summoning Brewers Manager Craig Counsell to discuss the issue at hand. Replays indicate Brewers second baseman Jonathan Villar—initially stationed on the third-base side of second base—walked across the middle infield and onto the first-base side of second base during Davies' delivery, and, in doing so, purportedly distracted Piscotty. Case Play Question: Although Piscotty appeared to have been distracted by Villar's mid-pitch movement, Barrett nonetheless ruled the pitch a strike based on its location, while Barksdale delivered an apparent warning to Villar. Based on Rule 6.04 regarding Unsportsmanlike Conduct (see the library, below), was Barrett's decision correct? Should the strike have been cancelled? Should Villar have been ejected? Answer (Click here for a Video Answer): Although the term "disconcertion" does not appear in the Official Baseball Rules, we're using that word to distinguish between inadvertent distraction and deliberate unsportsmanlike disconcertion. 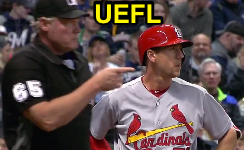 Since "deliberate unsportsmanlike intent" is required for Rule 6.04 to apply, the umpires must determine whether Villar clearly intended to disrupt Piscotty's concentration on the pitch, a high burden of proof. Note that Rule 6.04 oddly allows for a balk to be nullified (essentially, correcting for a fielder distracting his own pitcher, but not the batter), but not a legal pitch to be nullified. Thus, the strike stands. With no evidence to suggest Villar's actions rose to the level of deliberate unsportsmanlike conduct, umpires simply warned him—and his manager—not to do to move during delivery again pursuant to Rule 8.01(b), which grants umpires the "authority to order a player, coach, manager or club officer or employee to do or refrain from doing anything with affect the administering of these rules, and to enforce prescribed penalties." If, after receiving explicit instruction not to do so, Villar again engaged in identical disruptive behavior, his distraction would rise to the level of disconcertion, and may subject him to removal from the game pursuant to Unsportsmanlike Conduct Rule 6.04. OBR 6.04: "Unsportsmanlike Conduct: No fielder shall take a position in the batter’s line of vision, and with deliberate unsportsmanlike intent, act in a manner to distract the batter." OBR 6.04 PENALTY: "The offender shall be removed from the game and shall leave the playing field, and, if a balk is made, it shall be nullified."